Today’s first involved a very late tea time with fresh biscuits courtesy of Cracker Barrel. 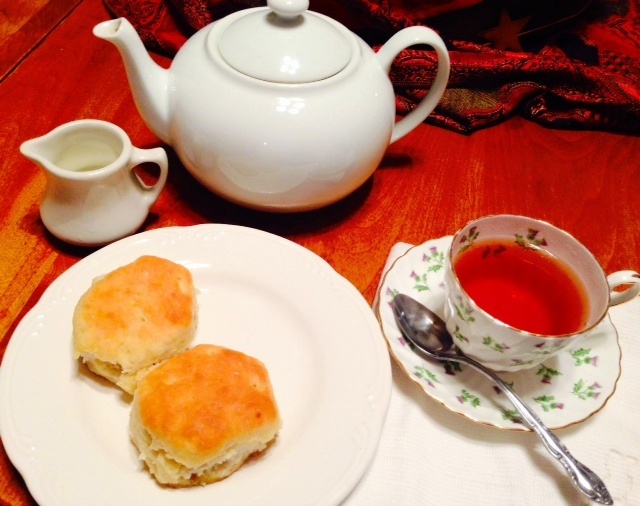 With a pat of butter and blackberry jam added to the hot biscuits, this simple tea was an easy delicious dinner. What made this one special was the use, for the first time, of a vintage teacup from the collection of Leta Moore. Greg’s mom, Leta Mae Davidson Moore, introduced me to the joy of drinking hot tea years ago, when I was a young woman in my late teens. She favored tea over coffee and would prepare both of us a cup of the fragrant hot drink with a dollop of milk added. We would sit in her homey kitchen and sip tea and chat. Her grandparents, George Davidson and Sarah Pearson Davidson, were originally from England, and settled in the Wichita, KS area. It makes so much sense to me now. I expect the custom of tea time was handed down in her family, from those English grandparents. I don’t know for sure. Mimi Leta, as my children affectionately called her, passed away 15 years ago. Unfortunately, I never asked her how she acquired her love for hot tea, I simply enjoyed the treat with her. Mimi Leta collected teacups and saucers. 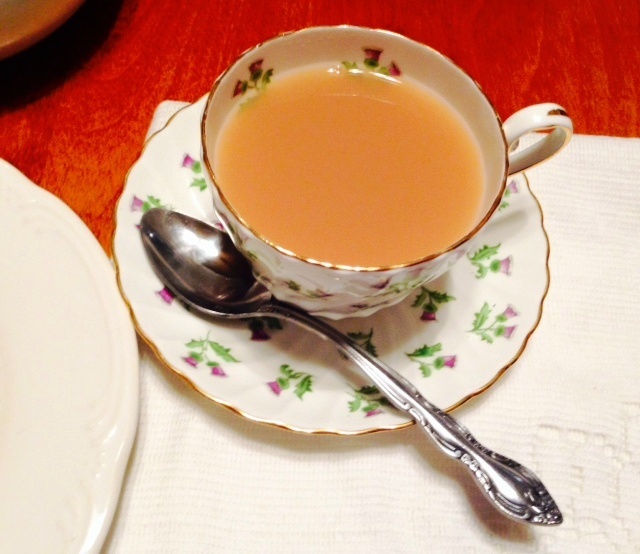 Family and friends knew about her love for tea time and frequently added to her collection. I’ve stood many times and looked at the teacups and saucers on display still in her home. Recently, after my return from Scotland, Greg’s dad allowed me to select several sets to bring home, to use with my own tea time. As I slowly studied the collection, a teacup and saucer caught my attention. I couldn’t believe I had never noticed this one before! 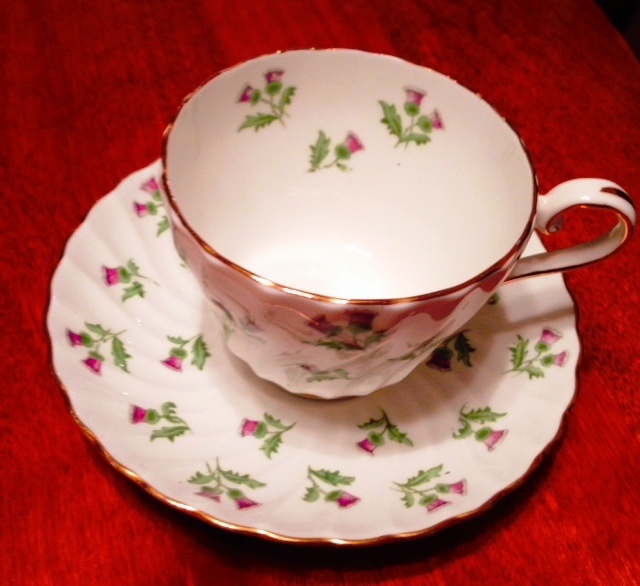 Because of my days spent in Scotland, and my raised awareness of all things Scottish, I spied a delicate teacup and saucer set covered with thistle, the national flower of Scotland! Holding the cup carefully, I knew I had found the set that was destined to become mine. I googled the stamp found on the bottom of the cup. The set was made by Aynsley, a china company in Staffordshire, England, that has been creating fine bone china since 1775. Called, appropriately, the Thistle Pattern, this design is from 1951 and is no longer available. I don’t know if Leta bought this cup and saucer set herself, or if it was a gift. I will cherish it. I have been saving the set, to use as a first experience. I chose to enjoy the teacup this evening. Because of the gold gilding, I will never place this bone china cup in the microwave to create a quick cup of tea. Both the gilding and the age of the cup called for the more traditional brewing of tea in my white teapot and the careful pouring of the tea into the cup. As I savored the Scottish Highland Tea, I thought of Mimi Leta. Oh, the questions I wish I could ask her now and the conversations we could have. Every time I enjoy a cup of tea in the thistle teacup, I will think of her, with gratitude, and I will think of Scotland. I will image her sitting across from me, smiling with approval. Someday, we will share tea time again, and all my questions will be answered!